Dogs will eat almost anything, which means pumpkins are not out of the question. A dog can be curious about pumpkins considering Halloween has now past. You may be unsure whether dogs should consume a vegetable with fiber. Well, the good news is pumpkin is a good source for dogs. Pureed pumpkin, for example, can assist dogs and cats when it comes to both diarrhea and constipation. If a tablespoon is added to their daily meals, it can help keep them regular which is a good thing for those who are anxious about pet sitting but it should be done while supervised by the owner. Pumpkin seeds are also high in essential fatty acids and antioxidants and the oils in pumpkin flesh and seeds also assist in urinary health. They are a good source of potassium, iron, beta-carotene and they may reduce the potential that the dog is going to develop cancer. Dogs seem to like pumpkin naturally, they will be grateful for the additional flavor. Pumpkin can also be a healthy addition of moisture to the diet of a dog though it is advantageous for the pets that have diets which consist mainly of dried kibble. Because kibble may need an increased secretion of stomach acids and pancreatic enzymes in order to assist with the digestion of the dog, dried kibble may have a dehydrating effect on your pet. However, your pet sitter can add moisture-rich foods to the diet of your dog in order to assist with the dehydration. They can add pumpkin to your dog’s meals or even serve it as a healthy snack which can help increase the hydration levels for the dog. Your pet sitter can increase the dietary fiber of the dog if it is suffering from diarrhea. 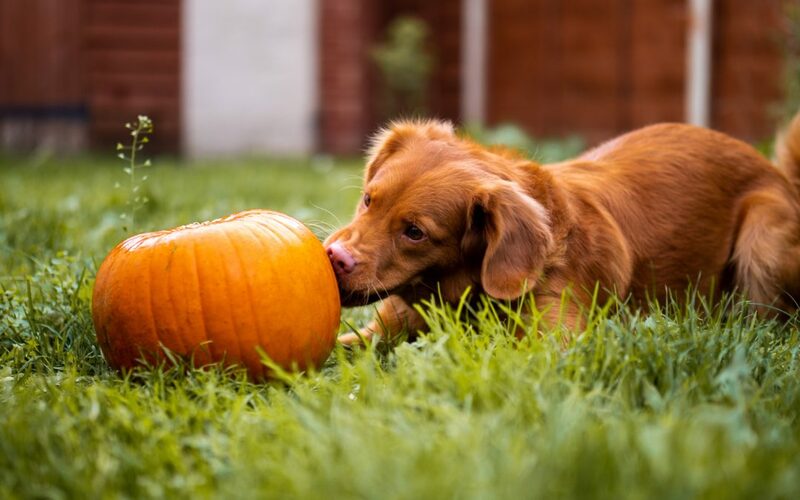 Pumpkin flesh has soluble fiber which slows down the digestion of the dog and it can help assist with the condition by absorbing much of the water. Take note that changes in the food, or the dog eating something that they should not, all make them prone to bowel diarrhea. Additionally, it is not wise to allow the dog to eat the pumpkin’s stem or leaves, as they are covered in small hairs which can cause irritation to the mouth and the intestinal tract. Dogs should also never eat the shell or the gourd.